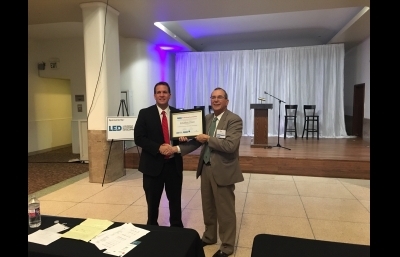 November 15, 2018 - Jonathan Dean, Business Developer for Cleco Power, is the newest recipient of the prestigious Certified Louisiana Economic Developer (CLED) designation. The award was presented at the Fall meeting of the Louisiana Industrial Development Executives Association (LIDEA) in Baton Rouge, Louisiana. The CLED program consists of an extensive and collaborative process of coursework and evaluation. According to the LIDEA website there are currently twenty CLED's in the entire state. Dean's CLED thesis is entitled "Public Investment in Infrastructure and Its Impact on Economic Development". Before joining Cleco, Dean served as elected Mayor of the Town of Ball in 2011 and served until 2015. His community activities involve serving as Chairman of the Central Louisiana Chamber of Commerce Infrastructure Committee, Past Vice Chair of the Central Louisiana Infrastructure Beltway Commission , Past Board Member of the Central Louisiana Economic Development and Alliance, Treasurer of the Rapides Senior Citizens Center. He is a member of the Alexandria Downtown Rotary Club. He is also a 2018 graduate of the Community Development Institute at the University of Central Arkansas and received his Professional Community and Economic Developer (PCED) designation in October of 2018.